My friend Ben is a time traveler. He is a young man whose passion and values hearken back to an earlier time. In our hyper busy culture, his calendar is seasonal. In our technologically driven society, he is most attuned to subtle changes in the weather (moisture level, wind, temperature). Like our ancestors 100 years ago, he seeks to live in harmony with the natural world. Ben is a farmer. Ben also seeks to walk in harmony with a wisdom teacher named Joshua, who lived 2000 years ago. This teacher was a healer and prophet who sought to show us how to live in harmony with the Creator, one another and with creation. How does a time traveler like Ben live in the present? How does he take values gleaned from the past and put them into practice today? The answer is found in watching Ben do his work as the site director for the Food Project in Beverly, Massachusetts. 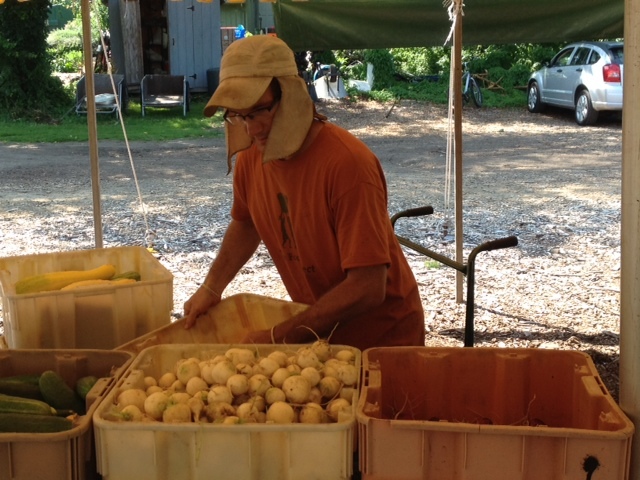 There Ben and his team of young people work several acres growing produce from seed to fork. Food Project is a six-week youth development program that uses sustainable agriculture as its foundation. Teens from a diverse economic, geographic and racial mix come together to learn sustainable agricultural practices, working as a team and honing leadership skills. They help to raise the 250,000 pounds of tomatoes, squash and field greens that will eventually be donated to hunger relief organizations, sold in neighborhood farmers markets, Community supported Agriculture Shares (CSA) and restaurants. Food Project farms are found on one acre sites in inner city Boston and in a North Shore community like Beverly. While Food Project is not religiously based, my friend Ben integrates his love for the earth, love for healthy affordable foods and his love for Joshua, also known as Jesus. 2000 years ago, Ben’s teacher said: “Whatever you do unto the most vulnerable of my family, you do it to me.” For Ben taking care of the earth, providing healthy affordable food and empowering young people to work for the common good, all this is sacred work. Ben’s good work inspires me to be a time traveler too. He reminds us that sometimes our best examples for living well in the present, are to be found in also living in the past.